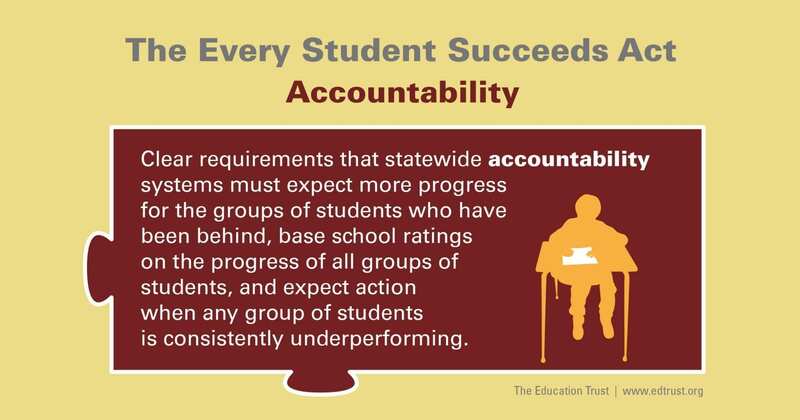 As state leaders work to implement the accountability provisions of the new Every Student Succeeds Act, they are making key decisions about how they will measure school performance, the expectations they set for schools, and how they will support schools that are struggling. The question of what to measure, in particular, has gotten a lot of attention. Equity advocates have pushed their states to maintain the focus on the key work of schools, preparing all students for college or meaningful career opportunities. As a result, many states are focusing on whether schools are getting students to grade level — a critical minimum bar that too many schools are still struggling to reach, especially for low-income students, students of color, students with disabilities, and English learners. And they’re adding other key student-focused measures, like chronic absenteeism and participation and success in rigorous courses, which research shows matter for future student success. Maryland, however, could be headed in the exact opposite direction. The state’s legislature recently passed a bill that deprioritizes academic outcomes, while requiring a variety of school quality indicators, some of which — like class size and case load — aren’t focused on students at all. Others, like “opportunity for Advanced Placement courses and International Baccalaureate programs” prioritize course offerings over actual course enrollments, ignoring the fact that even when these courses hypothetically exist, schools have all sorts of ways of limiting who actually gets to take them. This means that Maryland parents may be told that their schools are doing just great because their class sizes are small, and because the school offers a variety of Advanced Placement classes — even if few students are on grade level, and only a select few (very likely White, higher income students) actually get to enroll in those college-prep courses. In recent years, Maryland has taken important steps to increase the honesty and rigor in its education system. The state has raised its standards. It has included more students — especially students with disabilities — in the National Assessment of Educational Progress. This new bill could dramatically reverse this progress, leaving Maryland — often considered a leader in education — in the unfamiliar position of trailing behind other states. The Maryland State Board of Education and Gov. Larry Hogan are right to oppose this legislation and keep sights set higher for Maryland’s students.